I was at a party the other night and was struck by how many people there had deep spiritual interests. On top of this, they were all pursuing powerful and purposeful lives. In short, they were wanting to do good in the world. We got talking about ethics and where our western thought around what is right or wrong, good or bad comes from. One woman in our circle studied philosophy and ethics extensively, and declared that she always had trouble with the dominance of ‘white men’ as the pinnacle of ethical thinking, at least in the West. The conversation wasn’t all ‘gendered’ either. We unpacked a number of dimensions of modern ethical thinking, including this obsession with rational thought and how that might have influenced our thinking in this way. As our conversation unfolded, it became clear that we all shared a belief or knowing around the principle of reincarnation. For some of us the knowledge that we are all Souls who inhabits many bodies over many lifetimes, has become such a central feature or lens through which we view ourselves and the world. Of course, reincarnation is not limited to our conversation circle. 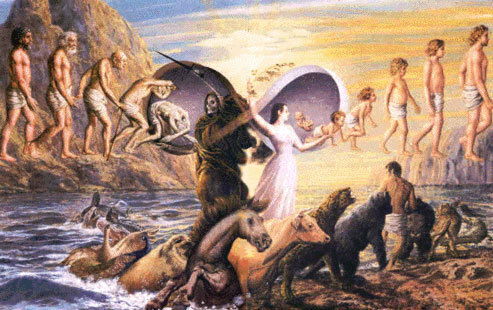 Reincarnation has been a central tenet of many spiritual teachings across the world for eons. While it has not been a central feature of the Christian faith (there are references to reincarnation in the Bible), I know of many Christians who have come to accept the possibility or truth of reincarnation as a way of explaining experiences that the mainstream Church does not explain. I hear more and more frequently children referred to as ‘old Souls’, as in “he is definitely an old Soul, he has wisdom beyond his years’. So what has any of this got to do with ethics or doing good in the world. I see karmic waves washing through the world of ‘doing good’ all the time. Why are we drawn to ‘fixing’ particular problems, or supporting certain causes? Are these just rational decisions that we make based on sound logic and compelling reason? How do you know whether what you are pursuing is driven by karma versus some other force? For me, I have become aware over time of some past lives, mostly through watching my dreams and paying attention to what comes up for me in different places. For example, when I first traveled to South Africa I had an overwhelming feeling of coming home. It was a really profound experience for me. Since I was a young child I had a strong affinity with the music of South Africa, as if I knew it already and was simply remembering it. At the same time another friend had visited South Africa and had a completely different experience. His was one of fear and apprehension. Also a know-er of past lives, he suggested that his reaction was to do with bad experiences in previous lifetimes that were still with him. How is it that we both had such different reactions to the same stimulus. This shows how our memories, knowledge, attitudes, beliefs and views of the world are not only shaped by this lifetime, but indeed many. So how does all this matter? How can reincarnation or a knowledge of past lives inform our work in doing good? I know many people who are working in projects thinking that they are doing so from a place of logic, and that the thinking that is informing the work is coming from stimulus in front of them right now. Surely that makes sense. But what if we are really pursuing our work to heal our own pasts and transform ourselves spiritually through our present experiences? What if there are deeper drivers that no audit or evaluation system will ever unearth? Does this even matter? or should it change what we do? Perhaps not. The power of understanding reincarnation and past lives for me is that it allows me to approach situations differently. Even though in the vast majority of cases I have limited knowledge of how I am connected to a situation karmically, I can still approach a situation knowing that in some way I helped bring it about. In this lifetime I am neither a victim, not a passive observer reacting to what is happening. I can choose to accept (or not) that somehow I am connected to that situation. This can explain why some people feel a deep responsibility to ‘right’ a particular wrong, or change a particular experience. For me in these cases, what I can bring to the situation is an attitude of seeking to understand, rather than being an expert seeking to be understood. It is tempting to approach an experience being the expert as if I am flying in as the ‘bringer of wisdom’. Actually, that situation has karmically reappeared to teach me a powerful lesson. I can also see that despite some situations looking rationally bad on the surface, there is an overriding spiritual purpose for them. Seeking to rescue someone from a painful situation may not be the best thing for them spiritually. How to determine that and approach it ethically is another thing. When do you step in, and when do you leave something be? Attempting to write about karma and reincarnation in a short post is ambitious and unnerving. I have been consciously examining this topic for the last decade or so, and am still to even scratch the surface in understanding myself in this way. My goal is not necessarily to know all there is to know – perhaps a lot of my past is blocked from memory for a good reason. What does interest me however, is operating in the world more consciously. Knowing how deeply connected I am to the situations I find myself in, and the responsibilities I might have is at times daunting, but also liberating. And look, I have written about all of this without even yet talking about love…without which our understanding is certainly incomplete. I guess I’ll be back with more then.